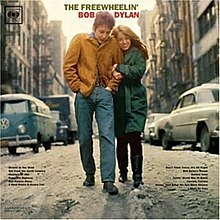 BOB DYLAN: THE FREEWHEELIN’ BOB DYLAN: 1963: 5 STARS OUT OF 5 STARS: The first Dylan album showed promise but this his second was the big breakthrough. On the first album he only wrote two of the songs on this one he wrote all but two. Highlights- my favorite song here would be A Hard Rain Is Gonna Fall, the most famous is Blowin’ In The Wind, Girl From The North Country, Masters Of War, Oxford Town, Don’t Think Twice It’s Alright, Bob Dylan’s Dream, Talkin’ World War III Blues and I Shall Be Free are all first rate. Dylan was on his way! Great album cover also with his then girl Suze Rotolo. 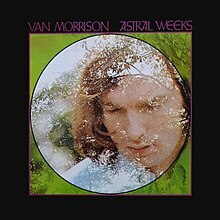 VAN MORRISON: ASTRAL WEEKS: 1968: 5 STARS OUT OF 5 STARS: I listened to this just a couple days ago- but am starting to listen to to Van’s album from the first to last.. not that I mind I could listen to this every day. What great musicianship on this album- and to think Van pretty much had no contact with the musicians- he did the singing and they came in and played–not much communication. It worked. ARETHA FRANKLIN: ARETHA NOW: 1968: 4 1/2 STARS OUT OF 5 STARS: In January Aretha released her first album on Atlantic- in the late spring came her second. She was on fire in 1968. The earlier album Lady Soul was outstanding- but I think I prefer this one more. OTIS REDDING: THE IMMORTAL OTIS REDDING: 1968: 5 STARS OUT OF 5 STARS: 11 songs recorded in a three week stretch before Redding’s tragic death in December 1967. Released in June 1968. Highlights- Dreams To Remember, The Happy Song, Hard To Handle, Amen, A Fool For You. Otis Redding being killed at the age of 26 a great loss to music.